Amid the clamor and saber-rattling, a persistent grassroots peace movement is working hard to chart the way toward lasting peace on the Korean Peninsula. In April, it was a handshake. On Tuesday, it was a hug — one that might end a 70-year-long war. The leaders of North and South Korea are meeting in Pyongyang this week to discuss the possibility of a peace treaty to end the decades-long conflict dividing the Korean Peninsula. This marks the third meeting between North Korean leader Kim Jong Un and South Korean President Moon Jae-in since April, when the leaders famously shook hands across the Demilitarized Zone, or DMZ, separating the two countries. After a swell of global optimism at warming relations between Kim and Moon, attention shifted to Donald Trump’s June meeting with Kim in Singapore. Despite the peace community’s hope for increased diplomacy following the summit’s vague yet optimistic outcome, many voices on both sides of the aisle in Congress, as well as within Trump’s own administration, have since disparaged the possibility for peace. Contrary to the frequent inflammatory rhetoric from leaders in Washington and the media, North Korea has made modest concessions since June, such as the dismantling of certain missile launch sites. In this week’s meeting, Kim has agreed to allow international experts to observe a permanent dismantling of a missile test site and nuclear facility. Despite these steps toward diplomacy, many government leaders are still demanding the immediate and complete denuclearization of North Korea — and they are doing so without offering any assurance that the United States won’t invade. At the same time, they are also refusing to announce the end of the Korean War, mostly due to fears that it could lead to a withdrawal of the 28,500 American troops stationed on the peninsula — even though Moon has dispelled such concerns. Amid the clamor and saber-rattling, however, a steady, persistent grassroots peace movement is working hard to counter the negativity. By influencing stakeholders behind the scenes, building new coalitions and reframing the narrative to promote negotiation as a difficult but worthwhile process, this movement has risen above “fire and fury” to chart the way toward lasting peace on the Korean Peninsula. These coalitions have allowed actors to coordinate strategically in pushing for clear goals, like a formal declaration ending the Korean War and sustained diplomacy on a path to peace. These coalitions have also been key in elevating a range of voices, particularly those of Koreans, women and people of color, who have often been marginalized from the mainstream policy debates in Washington D.C.
Korea Peace Network, or KPN, is one of the key U.S.-based coalitions promoting peace on the Korean Peninsula. Spearheaded by the American Friends Service Committee, Peace Action and Korean-American peace activist Christine Ahn, KPN works to educate and organize Korean peace activists around the country, from birddogging congressional candidates to hosting webinars and strategizing sessions. In June, the network organized an action called KPN Advocacy Days, which saw a group of advocates from KPN visit Capitol Hill to meet with key legislators, like members of the Armed Services Committee, to promote negotiations with North Korea. 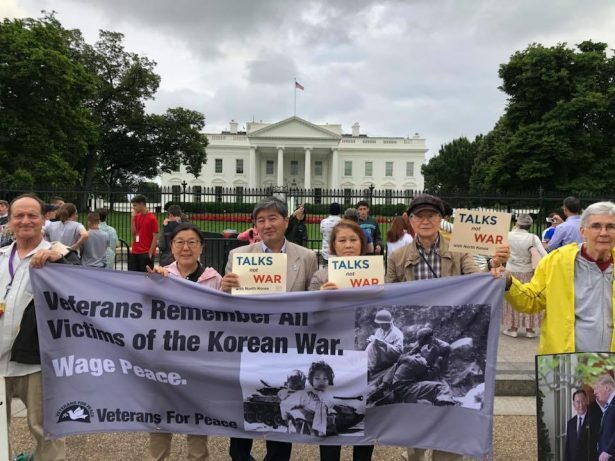 Kwan mobilized around 20 Korean organizations throughout the United States into a network called One Korea Now, so that they could better support each other’s efforts to advocate for peace. This mobilization became even more effective once they partnered with larger, more established organizations like Peace Action, which formed during the anti-nuclear movement of the 1950s and has a wider national network of its own. “It’s important to try to lift up those people who have much more expertise and more at stake for their families [if there were a war on the Korean Peninsula],” said Peace Action president Kevin Martin. At the same time, however, Kwan has found it uniquely challenging to incorporate some parts of the Korean-American community into this peace work. Recent organizing for peace on the Korean Peninsula has also underscored the importance of women-led organizations in mobilizing public support for peace. Women Cross DMZ is one of the leading groups in this movement, along with partners like the women-led activist group Code Pink. Headed by Korean-American peace activist Christine Ahn, Women Cross DMZ launched its efforts in 2015 by leading an international delegation of 30 women in a walk across the DMZ, followed by international peace symposiums in Pyongyang and Seoul. 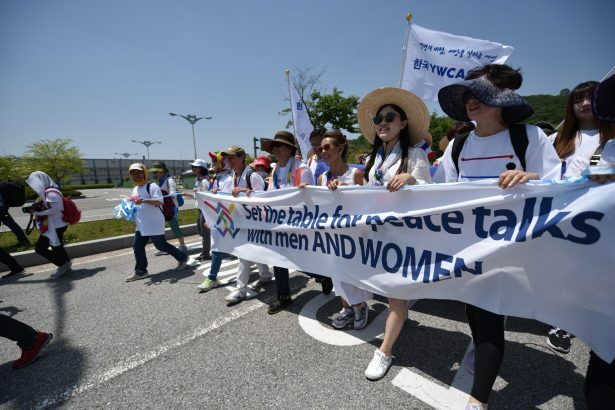 In May 2018, the group sent another women’s delegation to Korea, in partnership with the Nobel Women’s Initiative and Women’s Peace Walk. While there, the organizers convened an all-women’s symposium, met with key stakeholders and called for a peace treaty in an historic crossing of the Reunification Bridge. Not only have these coalition-building efforts raised attention and public awareness – they’ve also raised much-needed funding. Women Cross DMZ, Nobel Women’s Initiative and PeaceWomen were the recipients of a $2 million grant supporting women-led campaigns pushing for a viable peace process by 2020. Part of this funding will be allocated to a network of South Korean women working for peace, elevating their voices in the ongoing public debate about the Korean peace process. “In a moment when we all felt stuck, the fact that women’s groups began the process to break through this deadlock really shows the power of what peace movements can do, especially what women’s peace groups can do,” Ahn said. She also emphasized the important role women’s organizations have played in challenging those demanding total and immediate disarmament by stating clearly that there should be as much attention on diplomacy and steps toward signing a formal peace treaty, as there is on denuclearization. For 40 years, popular movements have demanded peace, democracy and human rights on the Korean Peninsula, including the 1979 student-worker demonstrations in Pusan, the Gwangju Uprising in 1980, and the campaign for direct presidential elections in 1987. In many ways, these uprisings culminated in 2016 with the South Korean Candlelight Revolution. This movement, which drew over 16 million people, denounced the corruption of then-President Park Geun-hye and paved the way to elect Moon Jae-in, a president determined to prioritize peace on the Korean Peninsula. Moon has made a marked departure from previous South Korean leaders’ provocative rhetoric over North Korea’s nuclear and missile-testing programs, returning to the “Sunshine Policy” of South Korea’s last two progressive presidents. In doing so, he has emphasized economic projects and cultural exchanges between the two countries, like building railways to connect the peninsula, arranging family reunions, and hosting joint sports matches with North and South Koreans. There have been numerous public events promoting reconciliation, like the Pyeongchang Olympic games in February, when both teams marched under a single flag and played a unified women’s hockey team. Since his election, Moon’s efforts to promote peace with North Korea have extended far beyond the two countries’ bilateral relationship. Trump has asked Moon to serve as “chief negotiator” for the third inter-Korea summit in September. This role is not only a testament to Moon’s diplomatic skills, but highlights the credibility he has built as a key actor in the negotiating process. As with Moon’s election, the peace movement has an important role to play in influencing key stakeholders within the Korean peace process, including members of Congress. The involvement of faith-based organizations like the Mennonite Central Committee and the Friends Committee on National Legislation, or FCNL, has been influential in pressuring stakeholders by finding common ground with legislators in Washington. FCNL has mobilized a network of over 1,500 people across the country in grassroots advocacy teams to lobby their congressional representatives. [Full disclosure: The author of this piece works for FCNL’s Advocacy Teams program]. These teams are promoting legislation that would require congressional authorization for any war with North Korea, as opposed to a unilateral decision by the president. According to FCNL North Korea specialist Anthony Wier, a congressional vote for war would make war less likely, as it would be a huge gamble for anyone running for reelection. Pursuing this goal of grassroots legislative pressure, advocacy teams have incorporated creative tactics, like giving out homemade bubble bath, or “bath bombs,” at their local farmer’s market. An accompanying sign reads “Bath Bombs Not Atomic Bombs,” seeking signatures on a petition for their members of Congress to support the legislation. Efforts to influence stakeholders in Washington has faced the predictable challenges of political partisanship — the force driving many leaders in the Democratic Party to decry negotiations and the drawdown of U.S. troops in South Korea. Despite misgivings about the Trump administration’s commitment to follow through on peace negotiations, leaders advocating a peace treaty with North Korea say it makes more strategic sense to acknowledge when the administration is ostensibly taking steps in the direction of peace. While many dismiss this view as wishful thinking or simply naive, the peace community believes incremental, tangible concessions from North Korea in exchange for economic and diplomatic incentives is a far more realistic pathway to peace than demanding a full dismantling of their nuclear program before they see any benefits. Ultimately, Martin’s point underscores the necessity of building a peace movement – and a peace process – that centers Koreans, the most direct stakeholders on this issue. As evidenced by Moon’s Liberation Day speech, language is helping to shape public opinion in favor of the peace process — with 90 percent of South Koreans supporting dialogue. Leaders of the peace movement are trying to do the same in United States, where a smaller majority — around 70 percent — support talks with North Korea. Such support is hampered by Trump’s low approval ratings and a distrust of Kim Jong Un. “We need to shift who talks about foreign policy away from a Cold War, white man framework,” Ahn said. One way of doing this is by giving a human face to the issue. Already, family reunifications and joint North-South soccer matches are taking place on the Korean Peninsula — something most Americans don’t even know about. “The peace movement should be helping to amplify these messages,” Ahn said. Ultimately, according to Chun, it’s about forging a narrative that is less about denuclearization and more about Koreans determining their own path towards peace. Many Korean-Americans are seizing the opportunity to make this known, while — at the same time — also providing a model for the rest of America on how to shift the narrative. This widening of citizen engagement and action can only be a good thing for advocates of the peace process. The more people come together in support of peace on the Korean Peninsula, the harder it becomes for world leaders to deny it to them. A very hopeful article about the Korean people leading the way toward peace in the Koreas. As former President Eisenhower said, “I would like to believe that the people of the world want peace so much, the governments should get out of the way and let them have it.” Hopefully the US will get out of the way and let the Korean people make a lasting peace.